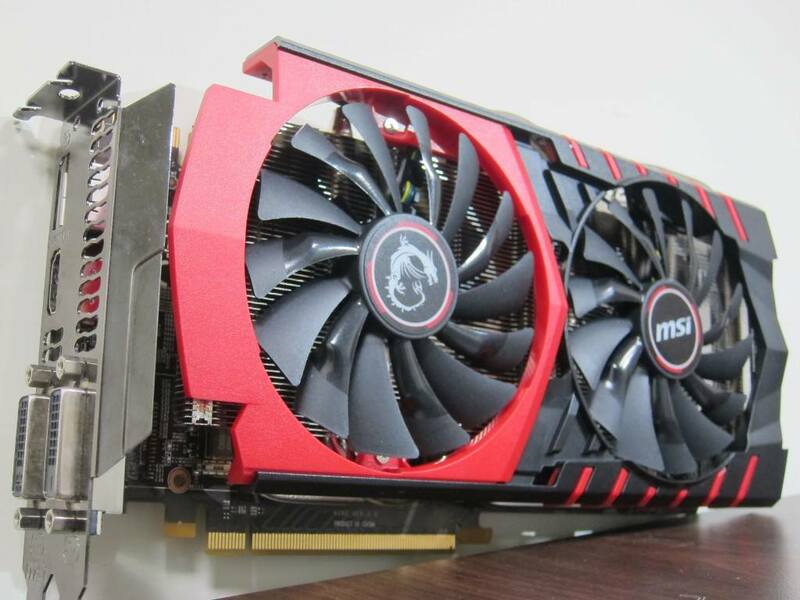 MSI recently shows off another render of their upcoming MSI GTX 970 Gaming graphics card (or could be the GTX 980) featuring a new Twin Frozr V cooler. If you noticed the shroud design (specially the red stripes) looks similar to the design/style on their X99 Gaming motherboard. Anyway, take a closer look at the MSI GTX 970 Twin Frozr V below and see if it fits your taste. UPDATE: MSI just posted a real photo of a graphics card with a Twin Frozr V cooler. According to MSI, they gave their MSI GTX 770 a make over. Hmmm GTX 770 or probably they are just teasing us with their GTX 970 Twin Frozr V.
MSI confirmed that the Gaming Twin Frozr V will be used on their upcoming GeForce GTX 900 series graphics card. They didn’t specifically mention which SKU will feature the new cooler first; it could be the MSI GTX 970, then GTX 980 or both. But for sure MSI will implement the same custom cooler in both GTX 970 and GTX 980 sooner or later. The new Twin Frozr V features three or four heatpipes, and two fans for cooling the large heatsink. The shroud matches MSI’s latest X99 Gaming motherboard design, so most probably we might be seeing an OC version of their GPU as well. We are not sure whether the rendered images are the MSI GTX 970 or GTX 980, most probably it’s the GTX 970. It features two 6-pin PCIE power connector, two DVI ports, and one (or two) HDMI port(s), and probably a DisplayPort if the second is not an HDMI port. You can also see two SLI fingers meaning you can install up to four of these in your system. Based on the recent Galaxy GeForce GTX 970 leaks, the reference GTX 970 features a shorter PCB just like the GTX 760. So we might be seeing shorter GTX 970 sooner or later. Also based on the said leak, the GTX 970 feature 1664 CUDA cores, 138 TMUs, 32 ROPs, 4GB GDDR5 memory running on a 256-bit memory interface. The base clock speed of the GTX 970 could be 1051MHz with a GPU boost speed of 1178MHz, and a memory clock speed of 1753MHz or 7012 MHz effective. Also based on the 3DMark Fire Strike benchmark leak here, the GeForce GTX 970 scored 10282 which is faster than the GTX 780 and R9 290, but just below the GTX Titan and R9 290X. The upcoming GeForce GTX 980 and GTX 970 are expected to be revealed during an upcoming NVIDIA Gaming event this September 19, 2014. But it is also reported that the actual availability of the GTX 980 and GTX 970 could be on October.